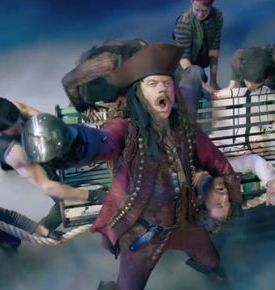 Welcome to Captain Jack’s Pirate Haberdashery. 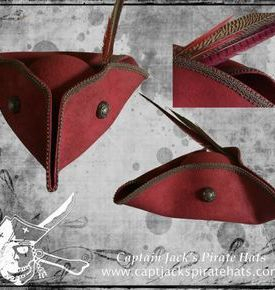 Here you can design and create your very own custom Pirate Hat. 1. 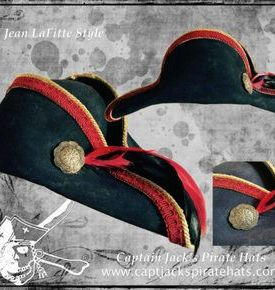 CHOOSE A HAT STYLE: To begin you need to select a pirate hat style from Captain Jack’s vast selection of pirate hat designs. 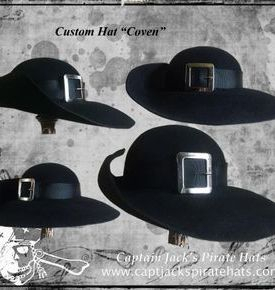 You can choose a pirate hat from Captain Jack’s Original Hat Series, Captain Jack’s Classic Hat Series, Captain Jack’s Specialty Pirate Hats or Captain Jack’s Movie Version Pirate Hats. Visit our Hat Styles Page to make your selection. 2. CHOOSE A HAT MATERIAL: You then need to choose a Hat Material. 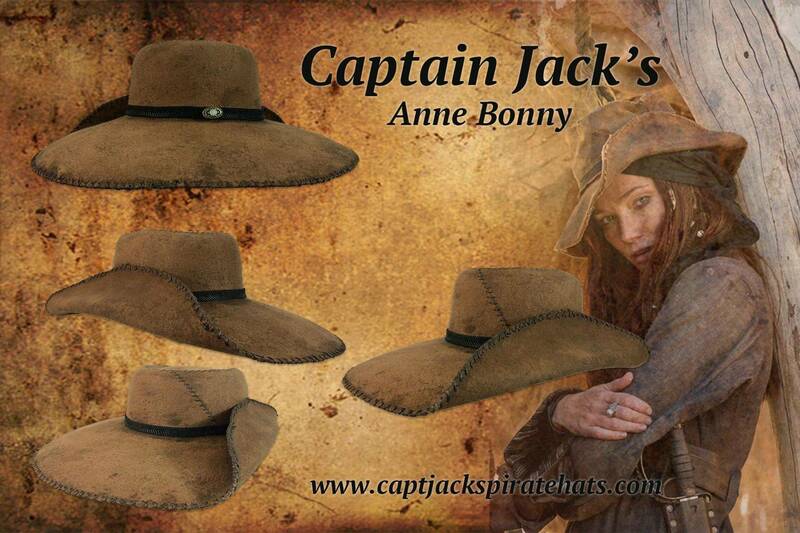 Captain Jack offers hats in Felt (Wool or Cashmere) Straw, and Seagrass (Natural or Indigo Dyed). Wool Felt- 100% fiber from sheep, harvested through sheering. No sheep's harmed in the process. Cashmere Felt- 100% Cashmere Goat Fiber, harvested through sheering. No goat's armed in the process. 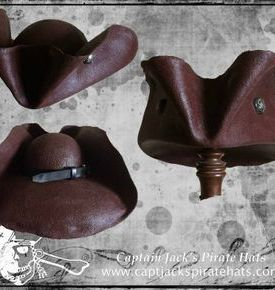 Straw- Captain Jack's Straw Pirate Hats are made off 100% American Yellow Straw. They have a nice golden tone, are light weight and great for warm climates like the Caribbean. 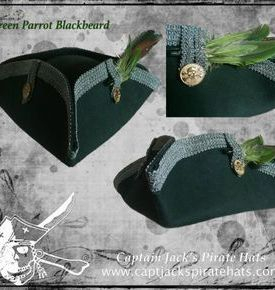 SeaGrass- Captain Jack’s Natural Seagrass hats are made of 100% Natural Seagrass. They have a mottled tan/green color and a more open weave when compared to the straw. They are light and airy and great for the Tropics. Indigo Dyed Seagrass- The Indigo Dyed seagrass are made out of Natural Seagress with strands of Indigo Dyed Seagrass woven into the hat. The stiffening process makes the indigo bleed into the rest of the seagrass giving the hat a streaked, mottled and unevenly discolored appearance. 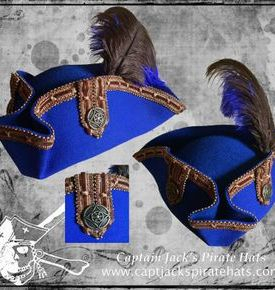 The Indigo Dyed hat is unique even among Captain Jack’s already unique line of hats. 3. CHOOSE A HAT TREATMENT: If you choose felt you then have the choice of three different felt treatments. Plain Felt - This is natural stiffened felt, with no other treatment. It offers minimal weather resistance and is not recommended for wearing repeatedly in ocean squalls. Stiff and will soften with wear. Economy price range. 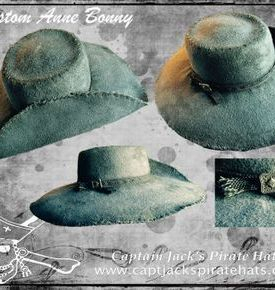 Acrylic Treated Felt - A Captain Jack's Exclusive Treatment, This offers moderate weatherproofing and gives the hat a dull matte finish, great for a weathered look. Rigid and a scarf or bandana should be worn for comfort. Middle price range. Oil/Wax Treated Felt - Captain Jack's Proprietary Treatment. This offers maximum weatherproofing, and most closely replicates the old world methods and look of treating seafaring hats with tar pitch, bees wax or animal fat, without the mess or smell. The MacKay uses a modern oil/wax hybrid. Hard and a scarf or bandana should be worn for comfort. Upper price range. 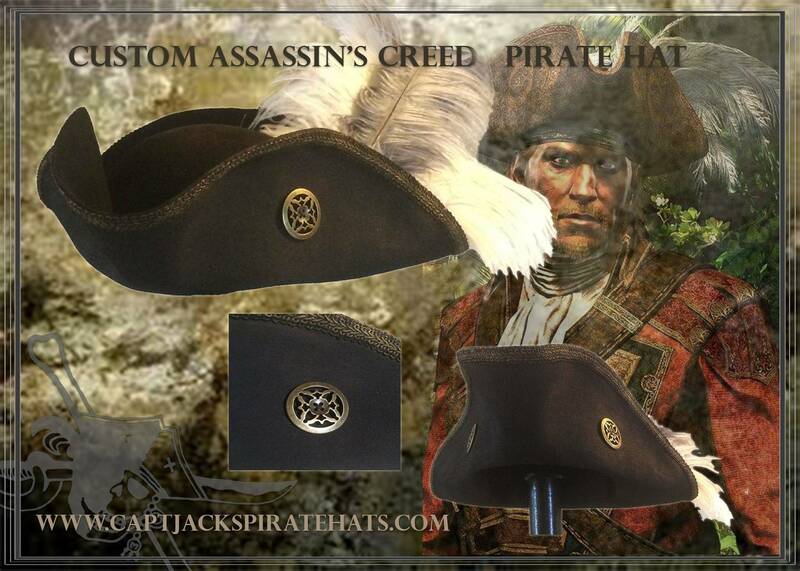 The Price will vary on pirate hat style and treatment. Plum, Purple, Navy, Meriot, Cherry, Red, Flame, Lipstick Pink, Dark Green, Avocado, Rust, Dark Chocolate, Tobacco, Gold, Wine, Burgundy, Black, Heather Grey, Royal Blue, Heather Charcoal, Cream, and White. 5. CHOOSE HAT SIZE: You then need to measure your head and know your head size. 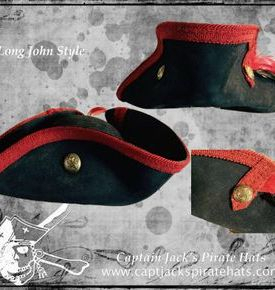 Captain Jack’s makes most pirate hats in 21, 22, 23, 24, and 25 inch sizes (crown circumference in inches). 6. 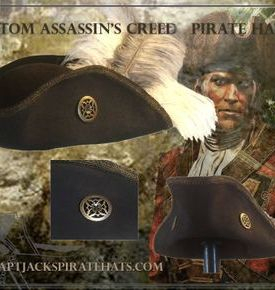 CHOOSE HAT ACCESSORIES: You can further customize your pirate hat by adding accessories. Look at the accessories page to see your options. Literally thousands of options to truly make your authentic Pirate hat unique. 7. PURCHASE YOUR HAT: You are now ready to proceed to the STORE to choose your hat style, material, hat treatment, accessories, color and size. 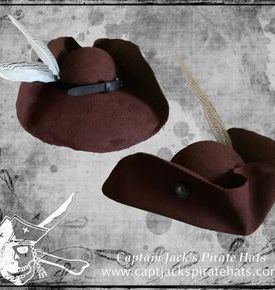 Once in the store you will see that our pirate hats are presented in 4 categories: Captain Jack’s Original Hat Series, Captain Jack’s Classic Hat Series, Captain Jack’s Specialty Pirate Hats and Captain Jack’s Movie Version Pirate Hats. 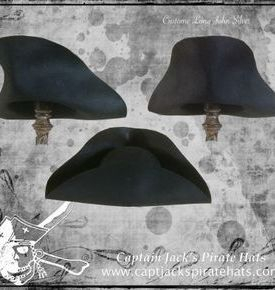 Captain Jacks Specialty Pirate Hats and Movie Version Pirate Hats are sold as described in the photo and text, the only customization is the hat size. 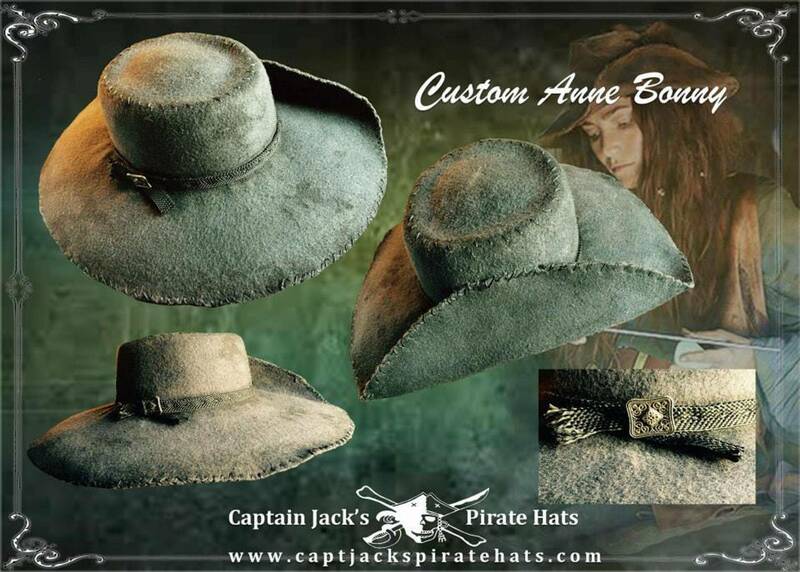 Captain Jack’s Original Hat Series and Captain Jack’s Classic Hat Series allows you to customize: Hat Treatment, Hat Material, Hat Color and Hat Size. You will make your selection in the store by choosing your hat treatment (based on price mark) and then will be able to choose hat size, color, style during checkout. You will choose hat style in a drop down menu and will be asked to put your hat size and color choice in selection boxes. Because of the vast variety of the choices we offer we are limited in how many options we can post on our website/store. 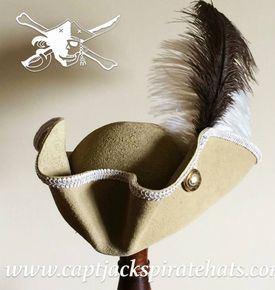 If you are trying to create a particular pirate hat and do not see what you are looking for in our albums or store please contact us and discuss your needs with us. 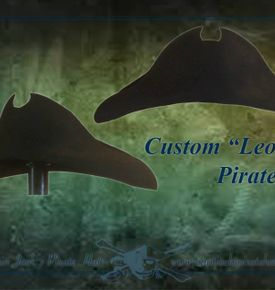 We would like to accomidate your desire and create your custom pirate hat to your exact specifications. You can reach the Master Hatter Jeff MacKay at 541-806-5225 or by email TheMacKayPirateFamily@gmail.com to customize your order further.